Every now and then as an ex-gamer I do remember the good glorious times of the DooM oldschool 3d shooter game. FreeDoom comes with a custom wad file called freedoom.wad which is a considerably good remake of the doom game, but still I don't find so funny and bringing memories as the original game. The DooM original wad files are already an abandonware and nowdays it's a bit hard to be found. Still the wad files for the games are available for download on some major torrent trackers like piratebay but it takes time to find them therefore I decided to publicly share the Doom 1, Doom 2 and Doom 3 wad files to be easier for me to later put and play them on Linux and BSD operating systems, on the other hand I do think this files might be useful for many other oldschool DooM fans out there. This entry was posted on Thursday, March 24th, 2011 at 4:34 pm	and is filed under Entertainment, Linux, Linux and FreeBSD Desktop. You can follow any responses to this entry through the RSS 2.0 feed. You can leave a response, or trackback from your own site. I have no sound with prboom on openSUSE 11.4. Also Doom3.wad crashes. Do you have any error messages while the prboom starts up? Make sure you have installed timidity (Software Synthesizer and MIDI Player) and you will have music. Hey There. I found your weblog using msn. This is a really smartly written article. I will be sure to bookmark it and return to read more of your useful information. Thank you for the post. I will definitely comeback. Generally I do not learn post on blogs, but I would like to say that this write-up very compelled me to take a look at and do so! Your writing style has been amazed me. Thanks, very great article. Did you tried following my tutorial. On Linux you should be able to play doom1, doom2 after downloading the DOOM wad files provided in the post. Magnificent goods from you, man. I have understand your stuff previous to and you’re just extremely excellent. I actually like what you’ve acquired here, really like what you’re stating and the way in which you say it. You make it enjoyable and you still take care of to keep it sensible. I cant wait to read far more from you. This is actually a tremendous site. I feel gamers are particularly prone to viruses and spyware getting installed while they’re playing video games. Most gamers tend not to prevent incoming packets with advanced firewall rules and may be victims of malware injections. This might become a topic for a potential article on your website. Thanks. Tip: Doom runs fine on windows 7 if you use ZDaemon. I don’t have doom 2 TNT or plutonia wad files or games, but you just gave me them. MUHAHAHAHAHAHAHAHAHAHAHAHA! When I play DOOM (1) on my computer, there is a white bar on the entire bottom of the screen. How do I fix this? Hi Don, what kind of drivers are you using and what kind of video card. Maybe if you’re using Vesa in the Xserver instead of vendor graphics drivers this might be reason for your problem. Also try changing screen resolution, this might help. Hi I have a couple questions please reply? 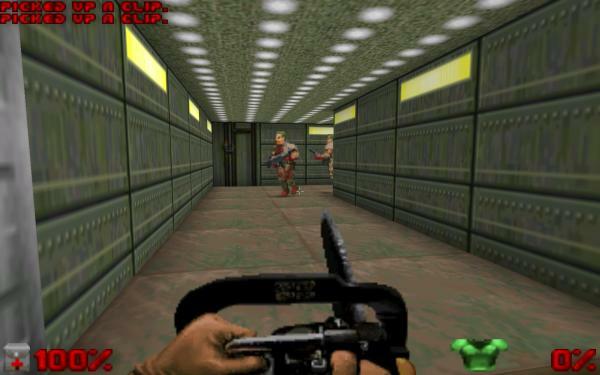 Can you add doom 3 roe wad file? What or how can i extract or unzip the wad files to play the games? or do i need just zdoom to run them? I don’t have doom 3 roe wad file and I think it is copyright protected thus can’t place it on my site. You don’t need to extract the wad files to play doom. Then launch it with prboom command. so that would be probably be the same with master levels & no rest for livign episode as well for copyright, good to know. So the first i should do is go to freedom website, then install prboom. Then add the wad files to prboom directory folder if it has one? then rename each wad to prboom? Not sure your Linux distro and version. Give a try this is the best way to know. Running this on Android, works like a charm. Thank you for this wonderful vintage wad package. WHO WANTS TO PLAY MULTIPLAYER W/ ME? I am trying to get a bootable flash drive to play the original Doom with on several old laptops (multiplayer) Do you think Lubuntu and PRBoom will work for this? Lubuntu would work most likely, but I use one of the many custom versions based on puppy linux precise 5.7.1 called Xprecise 2.2. I have it installed on a thumb drive with Doomseeker, Zandronum and a bunch of favorite mods. Also my nintendo, sega, arcade and psx emulators on there for added fun. Why would id Software use the Unreal engine when they’ve developed their very own idTech engines since the beginning? Besides their games, their engines are also something they’re very famous for, as they used to be THE studio whose engines kept on pushing the limits of hardware technology, and they have licensed them for countless productions. wanted and comfy P2P torrent engine available in the world. Sometimes your ISP may limit your bandwidth per month. When you have a file you would like to share, you’ll be able to upload it to your storage account. Greetings from Carolina! I'm bored at work so I decided to check out your blog on my iphone during lunch break. I love the knowledge you present here and can't wait to take a look when I get home. I'm amazed at how quick your blog loaded on my mobile .. I'm not even using WIFI, just 3G .. Anyhow, awesome site! In case of search wads fail, you can start Free Doom installed by default on ubuntu with prboom/prboom-plus. Make sure to install Gambas freedoom and prboom before use gBooM. La razÃ³n del estado de Arizona no puede usa propios ingresos para mantener a la intemperie Gran CaÃ±Ã³n es porque es un parque nacional. Eso significa que su estado y funcionamiento son autorizadas por el gobierno federal. Se hace posible el funcionamiento Es por fondos federales (crÃ©ditos), aprobada por ambas cÃ¡maras del Congreso y firmada por el Presidente. El uso de fondos no federales o fondos no autorizados a cobrar (como entrada al parque o tarifas a los usuarios) para la operaciÃ³n de un parque nacional serÃ­a un “aumento de la apropiaciÃ³n” y efectivamente ser una usurpaciÃ³n de la autoridad del Congreso. Es decir, una de las maneras que el Congreso asegura que su voluntad (y por poder de la voluntad de las personas) estÃ¡ forzada es por cualquiera que asigna el dinero a un programa o la retenciÃ³n de dinero de un programa. Las donaciones privadas para financiar un programa federal anula el Congreso ‘”poder de la cadena de bolsos” y por lo tanto es ilegal. Ahora … Si esta historia fuera cierta, Barak Obama el ciudadano privado podrÃ­a usar su propio dinero para mantener un museo privado abierto precisamente porque es de gestiÃ³n privada. Thank You in advanced if anyone replys, I am a hugh Gamer, mainly A Doomer! There is no sound using any of these on Zandronum… any suggestions? Do these work with gmDoom? Thank you very much. Worked like a charm for me. Will these work with Zandronum and the Brutal Doom mods? I am actually thankful to the holder of this web page who has shared this great post at at this place. A Good Game for anyone who loves Classical DooM! Just use GZDoom (preferably), or the way behind ZDoom, there are no other worthwhile ones. And that Doom1.wad is fake in the sense it’s the shareware one. Replace it with doom.wad (The Ultimate Doom) and we’re in business. Using PrBoom on MacOS Sierra, I can't seem to get any audio at all. Graphics are so great and smooth, just no sound. Maybe the executable binary has changed, try to list the installed packages with dpkg -l |grep -i doom and then dpkg -L doom-what-ever-package-name and look for the proper binary name. It works for me on my Android D-Touch app, thanks so much! Jackasses at Steam don't understand everyone doesn't own a damn computer so you are a real lifesaver!